I don't even know where to start or how to begin to describe what a wonderful extended Memorial Day weekend we had in Kings Canyon and Sequoia's National Parks. There is no way I can share everything we saw or did in one post so, just to get a start, here are some highlights of our trip. Much more to come as we catch up on some much needed rest and try to get back to real life. 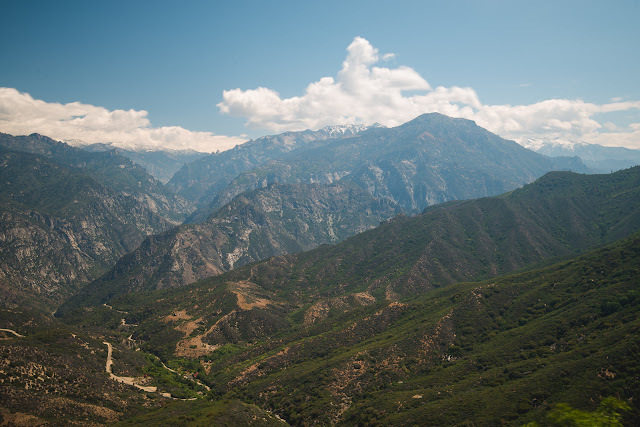 Sequoia's and King Canyon are two separate National Parks. Kings Canyon sits on top of Sequoia National Park with Sequoia National Forest on the left side. The main road from each park, snakes through Sequoia National Forest and, despite the signs when entering and leaving each park, it can be confusing which park is which at times. We arrived Saturday morning after spending the night at a hotel just outside of Fresno. After one night in a hotel, we kissed warm beds and running water good-bye as we camped for the next four nights among the bears. I was a little worried how we would fare with four back to back nights of camping, especially since the forecast called for freezing temperatures at night. Our first night was spent at Princess Campground and was by far the coldest night. Getting up and being cold in the morning was a little tough for Landon, but he got through it and we moved to Hume Lake for the next three nights where the elevation was a little lower and the temperatures continued to rise each day. When leaving, I asked everyone what their favorite part of the trip was and Landon's was camping. To be fair though, we all loved it. I never thought I would enjoying camping as much as I do, but there is something about being in nature for an entire day AND night that awakens the soul. And of course, there is no better way to spend quality time with the people you love most. 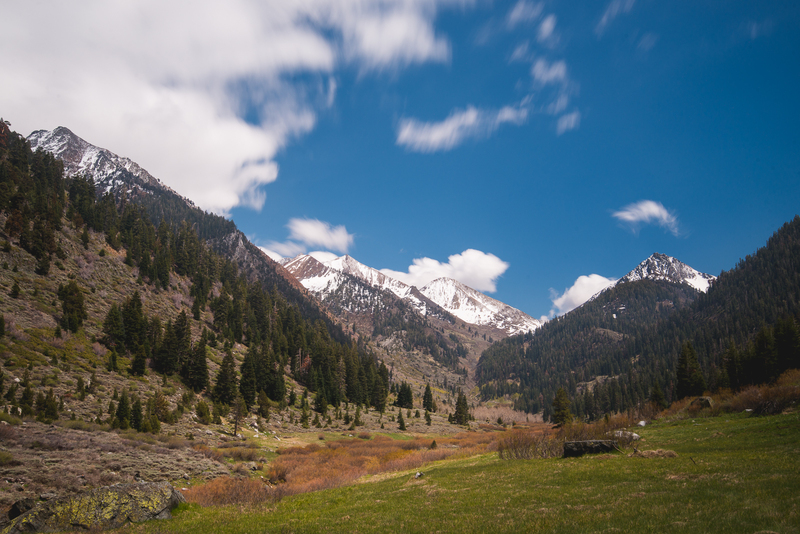 If Landon's favorite part of the trip was camping, Adam's favorite part was Mineral King. The one place Adam really wanted to go in the High Sierras of Sequoia National Park. We had to travel the entire length of Sequoia National Park, leave the park, and then continue 21 miles on the worst road imaginable to get back into the park at Mineral King. Beautiful skies when we started the day changed to overcast and then heavy fog as we moved up Mineral King Road to the elevation of 7,400 ft. We thought it was all for nothing and decided to make some lunch and then visit the ranger station before heading back. The ranger there encouraged us to take a short hike to a waterfall at the end of the road despite the thick fog. We decided it would be good to stretch our legs and just at the exact moment when we got out of the car to start our hike, the heavy fog lifted and the most picturesque scene we had ever laid eyes on. It was an adventure to say the least, but the most worthwhile adventure of the entire trip. And Mineral King would have been my favorite part of the trip if were not for one very unplanned, extra special encounter. On our last day, we were headed to our very last stop, Moro Rock. We turned down the road to get there when suddenly the car in front of us stopped abruptly for what I thought was a black cat running out into the middle of the road. The black "cat" was quickly followed by a second black cat and then a Black Bear, turns out the "cats" were actually tiny little bear cubs with their Mom. You cannot imagine my sheer delight as they ran across the road, then meandered about in the grass eating a little and playing around. After a bit, the Mom headed up a nearby log and the babies quickly followed behind. At one point, the cub right behind the Mama fell off so the other quickly ran past only to fall off as well. After struggling again to climb back on the log, the Mama hopped off and both, seemingly shocked at the useless efforts to be on the log, paused a few seconds before following suit. It was absolutely the most adorable thing I've ever seen. I've been wanting to see bears in a park for awhile, and at this point, we had already seen a number of them, but nothing compared to this encounter. Completely unexpected and happening so quickly, we only managed to get a small video of the cuteness. It might have been short, but it was by far the most special few minutes of the trip for me. And while these might have been each of our favorite parts, it doesn't mean there were not plenty of other contenders. For one, Kings Canyon, which is the deepest canyon in North America, is a spectacular sight to see. We explored it from top to bottom and it didn't disappoint. And then of course, there is the most famous trees of the area and the namesake of Sequoia National Park. 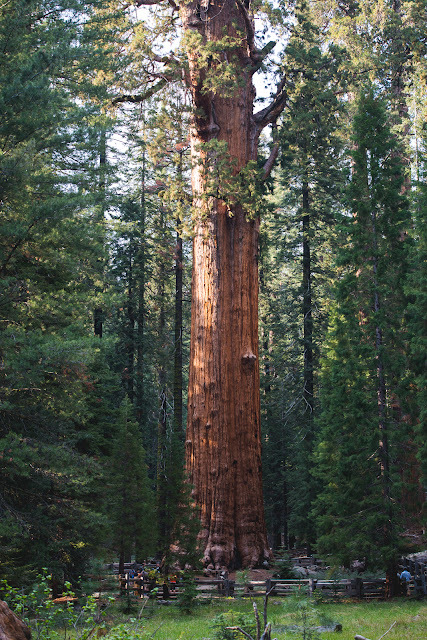 Although we've seen a few Sequoias in Yosemite nothing could prepare us for the vast number of Sequoias in both parks or the sheer size of General Grant and General Sherman. No matter how many we passed, we were always amazed and in awe in the presence of these giants. With so many things to do and see, these two parks quickly became our favorite parks we've visited thus far. We both agreed that while Yosemite is the most iconic California National Park, these two have won our hearts. We've already decided to go back this time next year for a short backpacking trip through the wilderness in Mineral King. Leaving was hard, but I am looking forward to our next visit and sharing so much more of this trip with everyone! Following up on my last post, I wanted to share all about our kayaking adventure last weekend. I love kayaking and was so close to purchasing one before we left Tennessee. So since we moved here, I've been dying to get out on one. We knew this would be a family event, and although Landon has been on a boat before (most recently on a catamaran), I knew he wouldn't be scared of the water but I wasn't sure how he would feel on a small kayak so close to water. I also wasn't sure how well he would participate in the activity and sit still. At first, I thought we would try out an outfitter in the bay but quickly decided it would be too much traffic. While playing on the beach at Pacific Grove a few weeks ago, I came across a kayaking outfitter and stopped to talk to them about taking kids out. They said the currents, at times, can be a little too strong for small children so their minimum age is usually 5 years old. 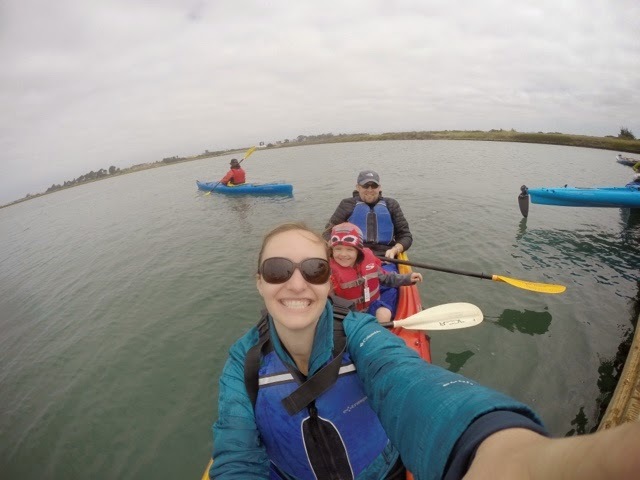 I always try and work around Landon's age and size instead of letting it stop us, so I was delighted when I came across Kayak Connections who gives a Family Adventure Tour in the Elkhorn Slough aimed specifically at young kids as young as three. 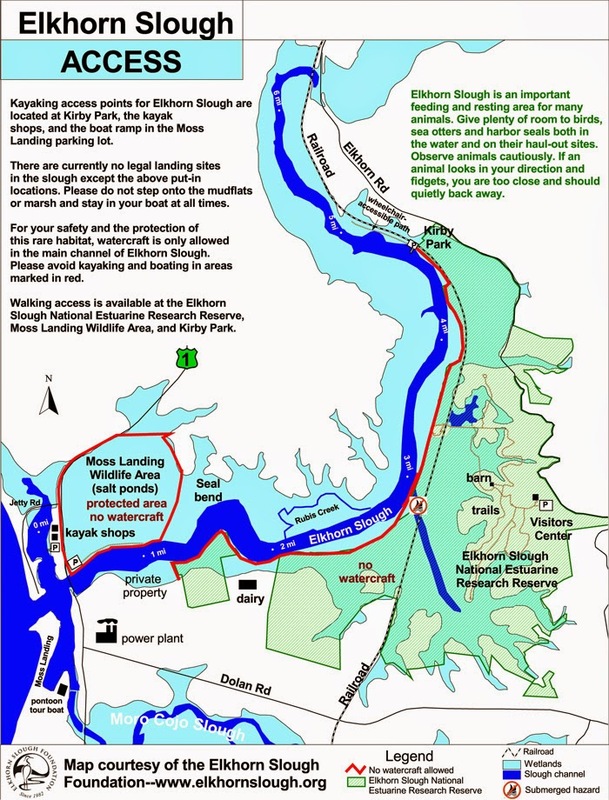 The Elkhorn Slough is a 7 mile waterway that is fed by the Pacific Ocean. Since it is made of salt water and open from the ocean, many ocean dwelling animals prefer the shallow waters of the slough. With little threat from larger predictors, its a perfect place to rest, sun, and even play. Here, you can get up close and personal with sea otters, sea lions, and harbor seals. Their cool,calm demeanor in these safe waters makes for an incredible encounter. So Sunday morning, after a night of nearby camping, we headed to Moss Landing for our 10 am tour. When we got there, we found out that despite the large groups, we were the only ones on the family tour. Which meant we had a private guide showing us all along and letting us determine the speed and focus. Although it wasn't planned, it made it that much more enjoyable for all of us, especially Landon. After getting on our Hammer waterproof pants, we had a little lesson on paddling, put on our life vest and headed for the dock. Landon didn't like his pants at first and insisted on pulling them up like shorts. They also gave him a half paddle so he could participate or at least try. Landon was a little unsure of the stability at first. He willingly got in the kayak, right in front of his Daddy! But, as you can tell from the picture, he didn't feel stable at all. Luckily, they had us in a two person kayak with a middle seat of sorts, which works perfectly for a small child. Being so large, it is a little harder to stear and slower than a single kayak, but I think having both us in their with him made him feel much more secure. It wasn't long before he was trying to paddle himself and asking all kinds of questions. Of course, most of his questions were about the buoy's placed all throughout, but he was enjoying it and participating which was more than I hoped for. Although the Slough is 7 miles long, we stayed mainly in the mouth getting up close and personal with sea otters, sea lions, harbor seals, cormorants, and even sand dollars.Almost brought to extinction as well, the Elkhorn Slough now has the largest population of sea otters in the wild. We watched them closely as we paddled within 5 feet of otters who were lounging on their backs, cleaning themselves, and eating their favorite dish of clams. Not sure how wet we'd be getting, I clumsily snapped a few pictures trying to show some of the animals. This was one of the first otters we passed. It's hard to tell from the picture, but they are much bigger in the wild than the ones at the zoo. They keep their nose, hands and feet out of the water as much as possible to keep them warm. Their bodies are covered in millions of hairs, but their hands and feet are not. They really are cute little critters and, as it turns out, pretty smart too. They love clams, but since they are hard to open, they carry around a little rock that help does the job. Since they eat over 25% of their body weight (which is about 70 pounds) per day in food, they spend a lot of time opening clams and would waste a lot of time looking for their tools. To help speed up the process, they keep a favorite rock tucked away in a pocket of skin around their armpit. That way, when get the clam, they can just pull out their rock and feast! Otters were not the only animals we got up close and personal with. As soon we entered the water, we made our way towards the mouth of the slough and passed a sand bank. Sunning on the bank was a large group of harbor seals with not a care in the world. As we passed just a few feet from them, they looked up or opened their eyes, but it probably would have taken quite an effort to disturb them. On top of being cute as can be, it is pupping season so many had their babies along the shore with them. Along the way, our amazing guide (Lauren, if you ever have a chance to go), took us to a cove, put her hand down in the water, and scooped up some sand dollars for us to see and touch for ourselves. Little did we know, sand dollars are actually dark in color. Only once they die do they get the white or bleached color most people are use to seeing. They also have thousands of spines on their underside which you can actually feel tickle your hand as the sand dollar tries to move. Landon preferred petting the sand dollar to holding it. And it is too bad sea otters don't get sand dollars because as Lauren pointed out, the bottom of the slough was covered in them. They actually stand on their side, using the current to filter food to them. All those dark spots in the water, are actually tons and tons of sand dollars just hanging out waiting for some food of their own. This kayaking trip solidified two things for me. My love and desire to own a kayak and our need to help Landon experience all of kinds of new things. For two hours, Landon sat still, engaged in questions about his surroundings, got up close to many different animals, and tried a new activity. And as neat as kayaking the slough was, the slough itself is worth a visit. With lookout points and walking trails, I know we will visiting again and bringing visitors. I'm not sure of the next time we will be getting out on kayaks, but it will happen. Maybe even when we get one of our own. This weekend was a long awaited celebration of sorts. The first four months of this year consisted of busy season for Adam and tons of studying for the brokerage exam for myself (which I unofically passed!). Between working and more working, we managed to sneak in a fun thing or two most weekends but, overall, we were just working hard and waiting for it all to be over. And now it is! To celebrate, we spent the weekend driving down the Pacific Coast Highway with some camping, kayaking, watching all kinds of wildlife, playing on beach, and, most importantly, enjoying lots of very much needed quality time together as a family. We started off early Saturday morning and started down the scenic Pacific Coast Highway just outside of Monterey. 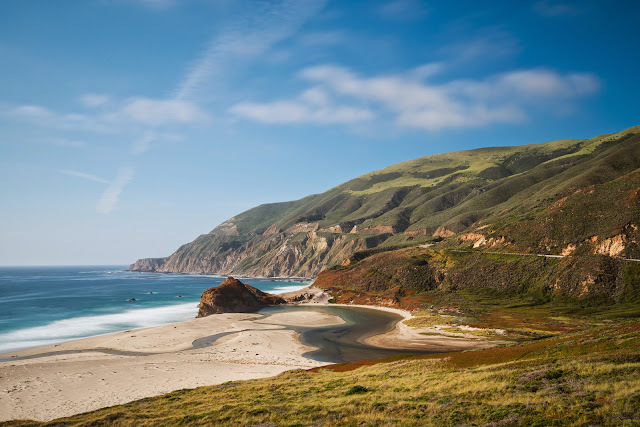 Here, we began our breathtaking drive towards our first stop, McWay Falls. Not far past Big Sur, this waterfall, which pours into the ocean, is small yet stunning and is one of the many things I had wanted to visit before we moved to California. A short, well marked hike takes you and the other 50 or so tourists along the edge of a bluff and across a cove for a view of this beauty. 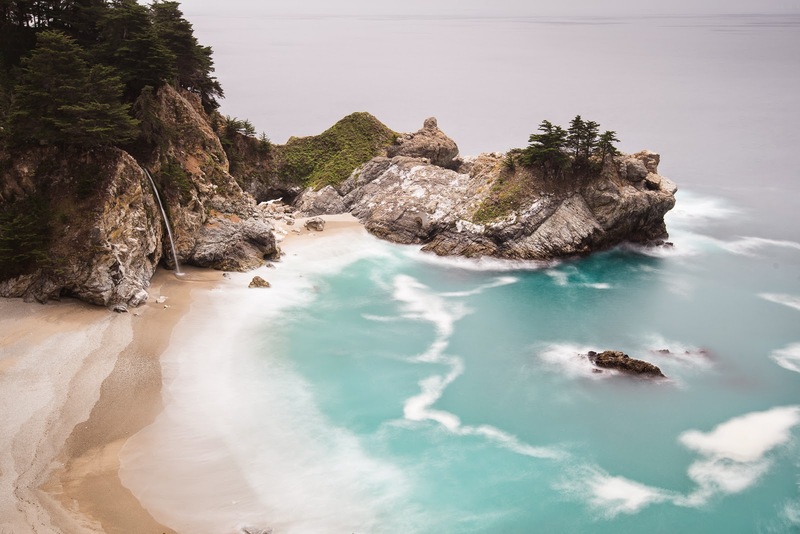 If any place along Hwy 1 captures the beauty of this area, it might be McWay Falls. After we were done stretching our legs and enjoying the view, we hopped back in the car and entered uncharted territory along the road. Since we hadn't driven this stretch yet, the views were now new and even more exciting and our stops became frequent. At one point, I thought I could see some movement in the water and, as if reading my mind, Adam pulled off at the next turnoff. We got out of the car and we could clearly see a number of large mammals out about 3,000 ft from the coast. Large, like whales, a large dorsal fin was clearly visible and before I let myself jump to conclusions, another watcher corrected my guess of dolphins by telling us they were in fact killer whales. Ever since I was young, I have LOVED killer whales. My Dad adopted a killer whale named Princesses Angeline for me as a young child and I would receive monthly updates on her whereabouts in the Pacific. I was fascinated by it. In Maui, we saw humpbacks up close and personal, but that excitement was nothing compared to being about to gaze at these black and white beasts from the coast. We counted over 10 in total, in what seemed like 2 pods. A photographer informed us they had just made a kill which explained why they were so close to the shore and staying relatively put. 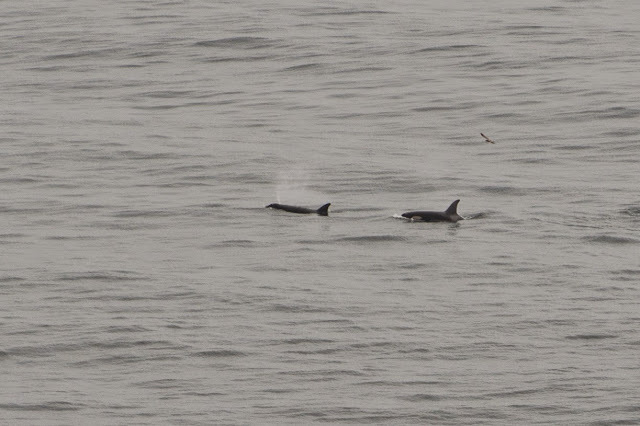 It was hard to get a decent picture given the distance and their quick breaks above water, but we sat on the edge of the land and watched them through our binoculars for a good 30 minutes. It was magical and a true highlight for me. Although I could have stayed there all day, we eventually made our way back to the car and onto the road. Around 3pm we passed a nicely situated restaurant and lodge and decided to stop there for lunch. In an effort to not spend a fortune, I split the burger with Landon which caused me to miss out on their fish & chips (something I later noticed was a big mistake). Despite my error, the food was wonderful and the views were spectacular. As much as I've read about Hwy 1, I've never read any recommendations for Lucia Lodge, but I know we will be going back for some fish and chips especially! At this point, we decided to turn around and start heading to our camp site back in Santa Cruz. 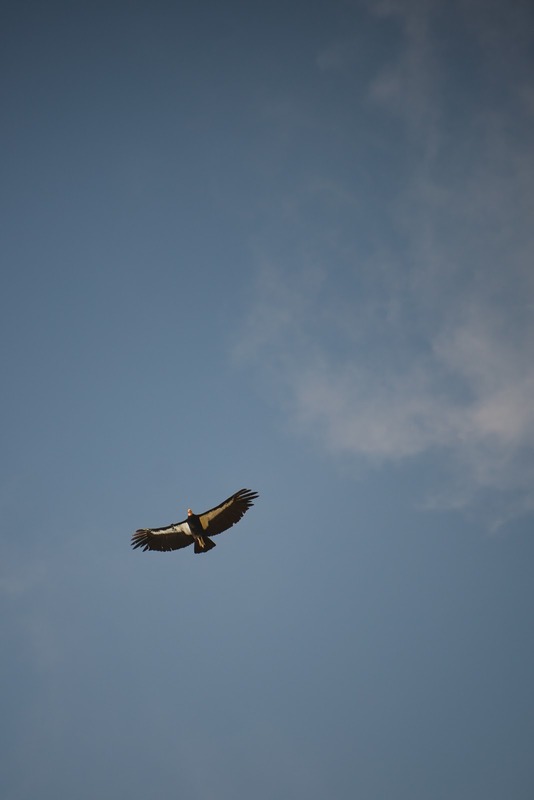 As we were headed back North, we noticed a number of large black birds riding the air currents just above the road. We've been anxious to get our first glimpse of a California Condor, the largest bird in North America. They were almost brought to extinction less than 30 years ago and today there are only about 400 in the wild which makes them one of the rarest birds in the world. At one point, we pulled over thinking we saw one overhead. 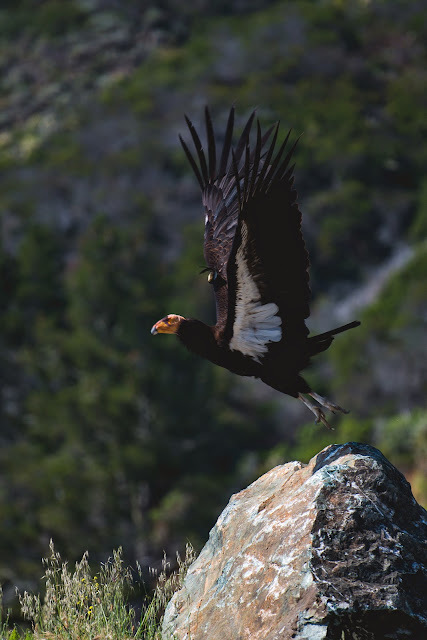 After spying what we thought was our first one, we got back on the road and rounded a corner to find an actual one (the first was actually a turkey vulture) sitting on a rock straight ahead of us. We quickly pulled over, which started a huge trend, and watched with a number of other people until he flew away. Not the worlds prettiest birds but their shear size is pretty amazing. Watching them glide effortlessly through the air with their delicate finger looking wings is mesmerizing. It was really neat to see them so close in the wild and not just one, but a number of them through out the day. We continued on the road back towards Santa Cruz, stopping a few times for pictures. These sights never get old. Not long before sunset, we made it to our camp site. One thing we've learned about California is how hard it is to camp. I dreamed of camping on the beach, but without 9 months of advanced planning, we ended up staying at a KOA for the first time. It wasn't really our ideal campsite, but it was a perfect place for Landon full of all kinds of activities for kids. It seems many people take trips to visit a KOA and there are enough things to do to keep kids busy all weekend long. Once the sun went down though, we made a campfire, cooked dinner, and I introduced my family to the glory of s'mores. After, a surprisingly restful sleep in a campground with lots of other people close by, we packed up our gear, got some breakfast, played on the playground a little bit more and headed just down the road for a kayaking trip. Since this was Landon's first time in kayak we decided to make it a gentle ride, forgoing a trip in the San Francisco Bay or ocean for a family oriented guided tour in the Elkhorn Slough. There is so much to say about our little kayaking experience, that I will have to save it for another time. Overall, we all had a great time getting on the water and we couldn't have picked a better place for Landon's first trip. When our kayaking was over, we headed a few miles South to Pacific Grove. We had visited only a few weeks prior, hoping to catch the ice plants at full bloom, but could tell they still were not at peak yet so we headed back to them a little more vibrant. It did not disappoint. I could have sat on that bench all weekend enjoying the beauty there. Pacific Grove practically ends at the start of 17 mile drive. Since we hadn't gone the drive before, we decided it was about time. We paid the $10 entrance at the gates, were handed a brochure, and began the slow drive along the coast made famous by the Pebble Beach Golf Course. Overall, we were not all that impressed with 17 mile drive. The drive was pretty but had nothing amazing or spectacular for the area. 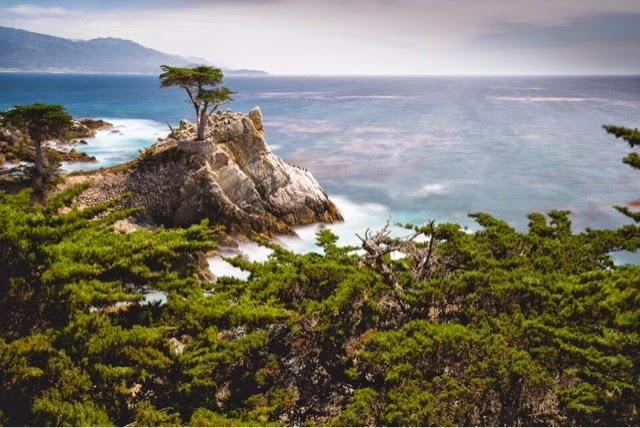 The most famous stop along the drive is the Lone Cypress, which is beautiful, but not quite the stand out we were thinking it might be. Of course, it is said to be the most photographed tree in the world so we of course obliged and snapped a few of our own. Hands down, the most spectacular thing along the drive were the homes. With our favorite in-car app (Zillow) pulled up we found homes as much as 37.5 million. It was incredible! Especially considering most were only 6,000 to 8,000 square feet. After being a little underwhelmed, we decided it was time to get out of the car and let Landon have some fun. There is nothing he loves more than playing on the beach so Adam pulled up a map to try and find a nice beach nearby we hadn't been to before. 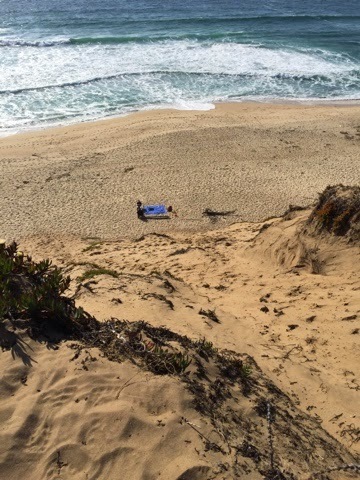 He picked a good one too, Fort Ord Dunes State Park. A new state park, this old military area was deserted by the military in 1994 and turned over to the state. The Dunes were once used as artillery ranges. 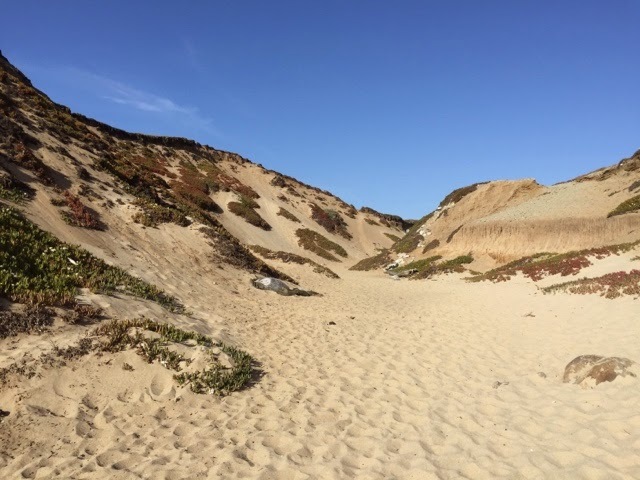 Just a short hike from the parking lot down the beach, I was surprised, just how beautiful these dunes were. Covered in ice plants and rising higher than I had realized when seeing them from the road before. 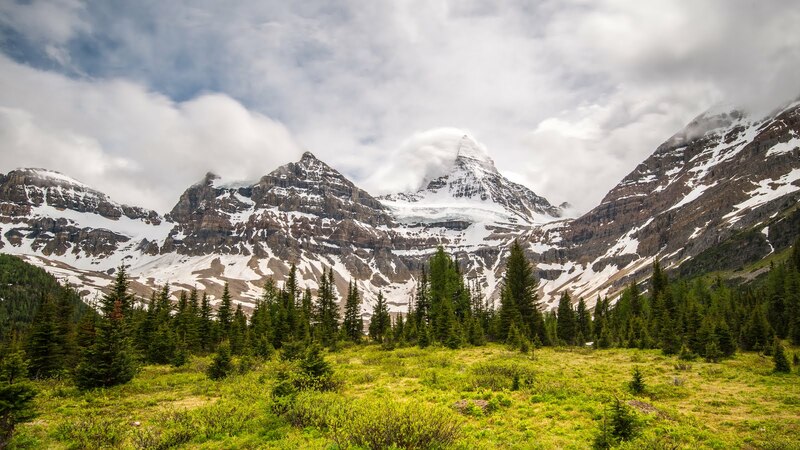 Of course, these high peaks only meant one thing for Landon, a place to climb! Once we put our beach toys down, he immediately set off to conquer them. I decided to try myself and it proved to be quite the work out.Adam took this picture of us working our way to the top. This one is from the top looking down, it was actually a little scary to see how high we were. But, it was sooooo worth the climb. The views were spectacular! Of course, the most fun was had by running/sliding down. 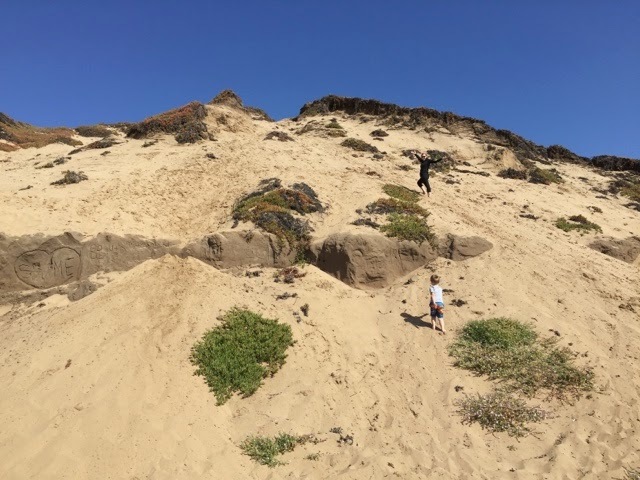 It was more of a controlled fall and didn't seem as scary since it was plush sand at your feet. Landon must have climbed up about ten times. He couldn't get enough and if it hadn't been so much work to get up, I might have had a few more goes of it. As much fun as it was, the weekend couldn't last forever, so after a few hours of fun and sun on the beach, we headed back in the car to make the two hour drive home. 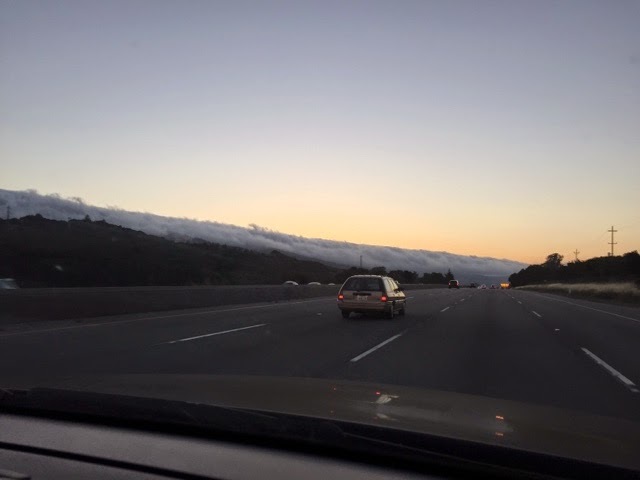 As we arrived back in the Bay Area just about sunset, we were greeted by Karl (the name of the famous fog) who welcomed us with open arms back home. A fitting end to a wonderful weekend!